As part of the growing literature on the South Asian diaspora, Impossible Desires attempts to offer a new perspective, which addresses both shortcomings in diaspora studies and queer theory. Drawing on examples from American and British popular cultural texts, in the fields of music, film, photography and literature, the seven chapters of the book cover a wide range of topics and subjects. Central to the critical thrust of the book is the location of a feminist queer subjectivity that is argued to be absent in much of the offerings of the cultural producers of the South Asian diaspora. Much familiar territory is re-worked, such as the film My Beautiful Laundrette, Bhangra music and Bollywood films. What is new in these already well-analysed forms is the use of literature as a critical tool for developing a feminist/queer critique. For example, Asian Dub Foundation's practices in the East End of London are compared to the book Brick Lane by Monica Ali. Although this is justifiable in the framework of textual interpretation that Gopinath adopts, it is difficult to understand the parameters and basis of these kinds of comparisons, other than that they are possible. A similar juxtaposition is made in another chapter where Canadian queer filmic texts are compared to V.S. Naipaul's work. Under the guise of ‘public culture’, it seems that geography and history can be collapsed to allow for a kind of literary tourism. This ‘view from America’ particularly of British South Asian diasporic cultural outputs always renders them as somehow authentic and exotic, reminiscent of much maligned anthropological treatises. Impossible Desires is ostensibly about making visible the previously ignored female queer diasporic subject, yet most of the book is a set of critiques of cultural projects and outputs which are not concerned with gender and sexuality. Deconstructing those texts to reveal the absent subject is a worthy cause, if somewhat politically dated, but of more concern is why so few queer diasporic cultural products are not presented? It is only in the epilogue that we are offered an analysis of the excellent photographic book, Red Threads, which is a collection of Poulami Desai and Parminder Sekhon's work. Even in this chapter, nothing of the authors' other collective outputs, in theatre or performance is mentioned. With Gopinath's desire to ‘focus on ephemera’ to recover the difficult presence of South Asian queers, there is an absence of the Queer Desi club scene which has a parallel and entwined history with the British Bhangra scene. Indeed, the chapter on music has sparse and scant references to places like the ‘Paradise Factory’ or to drag dance performers at these venues. Rather, the choice of texts to criticize is seemingly random (though this may also be a result of the fact that there are previously published articles in the book). There is little attempt to engage in an ethnographic or other manner with cultural products that are not already circulating in the overly inflated diasporic studies arena. Gopinath is consistent in the figure that she is trying to forefront in this book. It is the neglected or ignored queer female subject. 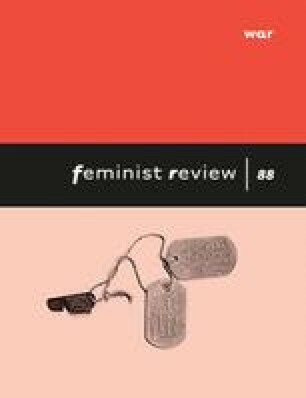 As the source of her critiques, the author is assertive in reconnecting feminist and queer concerns in an incisive manner. It is the identity formation of queerness combined with feminism that gives the book a political edge most closely associated with the identity politics of the 1990s. However, so much critique has already taken place of identity politics and this is not addressed at all in the opening theoretical or subsequent substantive chapters. In what senses does the queer female identity provide any kind of solace from the problematics of class, geography (UK or US) and migrant status, for example? In post-9/11 America how does queerness get co-opted into Islamaphobia? Gopinath rightly asserts the necessity of recognition, and within the politics of representation, the absences highlighted by the book are correctives to over-celebratory constructs of diasporic cultures. The critiques of Bollywood, British Asian film and Asian Underground music are not to be questioned in terms of the framework on offer. Rather it is the limitations of identity politics that could have come usefully under the gaze and as a radical queer theory has the potential to do this, it is perhaps disappointing that this book does not fulfill this.